RummyCircle, one of the biggest sites to play rummy for cash has announced a Combo Bonus that will reward the real money players with a rummy bonus and cashback. The offer will run on 21st November, Tuesday and applies to all players who deposit with the special promo code. Once the deposit is made, the rummy bonus will be credited instantly. To claim the cashback, a player needs to wait for another half an hour and play real money games in a timeslot of 4 hours to get a 5% cashback on the games he has lost. If you play free rummy games at RummyCircle, you won’t be eligible to claim this offer. The free rummy players need to deposit and play at least a cash game to qualify for promotions exclusive for real money players at this site. How to Get the Rummy Bonus & Cashback? To claim the combo offer of rummy bonus and cashback, a player needs to make his deposit on 21st November between times 12:30 PM and 2:30 PM. While depositing, make sure to use code NOVCOM17 to get rewarded with an instant bonus of 50% up to Rs.700. 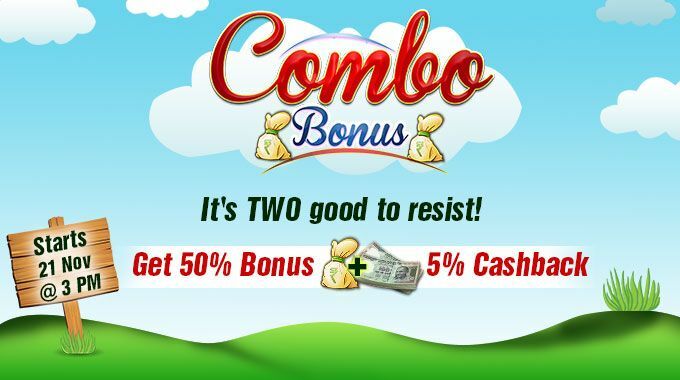 To get the cashback, a player needs to play real money games between times 3:00 PM and 7:00 PM. He will be rewarded with 5% cashback up to Rs.300 if he loses his deposit amount. The minimum number of games required to play to earn the cashback amount is 30. The complete details of combo offer from RummyCircle are as shown in the table below. If you are a kind of player who play rummy win cash, this offer is tailor-made for you! Claim this rummy bonus and cashback offer and let us know your experience on playing rummy for cash at this site by posting your views in the comment section below!